Nancy K. Discher was elected as Justice of the Peace, Precinct 5 and began her four year term on January 1, 2015. Precinct 5 represents Oracle, Eaglecrest Ranch, SaddleBrooke Ranch and SaddleBrooke. Judge Discher and her husband have resided in SaddleBrooke for eight years. 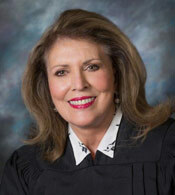 Educationally, Judge Discher has a Bachelors in the Science of Nursing and a Masters in the Science of Management. Her career spans over 30 years as a clinician, healthcare executive and executive consultant for two Fortune 500 companies. In these positions, Ms. Discher was responsible for business, regulatory, and legal practices. Additionally, she served on various boards of directors, was elected to professional organization boards, and volunteered on many civic and philanthropic boards. Nancy and Michael have been married for 25 years. Michael is a crew chief in the AZ Air National Guard, fighter unit. Nancy’s son, David, graduated from the University of Arizona with a degree from the Aeronautical Engineering program. He and his wife have four children, Nancy’s grandchildren.